Sweet potatoes are soft and creamy enough to be served as dessert and included in pies. In addition, they are a nutritious vegetable. Their sweet taste and nutritional value have made them popular in many cuisines. Some people argue that it is healthy and safe to eat sweet potato skin while some argue that it is unhealthy. So, can you eat sweet potato skin? 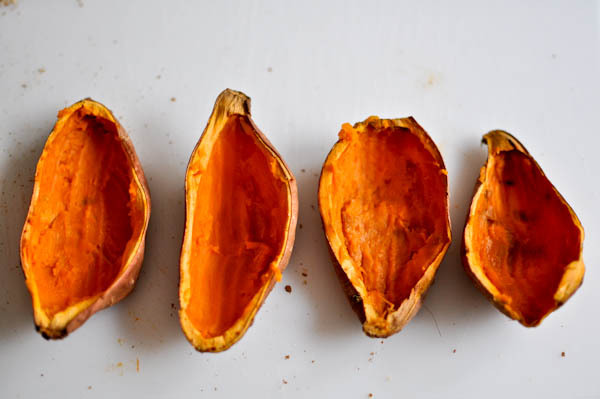 This article answers this question and outlines the nutrients found in sweet potato skin. You can eat sweet potato skin but you have to wash and scrub the sweet potato before including it in your recipe. The advantage of keeping the skin is that it helps retain nutrients and enhances nutritional quality, providing your diet with more nutrients such as fiber and potassium. If you decide to eat the sweet potato with its skin, choose organic sweet potatoes. Scrub them gently with a vegetable brush using cool water to make sure they're properly cleaned. You cannot answer the question, ‘can you eat sweet potato skin?’ without considering the nutritional content of the skin. The Center for Science in the Public Interest ranks sweet potatoes as a top nutritional vegetable. The additional nutrients in their skins make eating sweet potato skin beneficial. Some of these nutrients are discussed below. Baking sweet potatoes in their skin has more fiber than any other serving of oatmeal; a standard baked sweet potato with skin provides fiber of about 5 grams. The daily fiber requirement for men below 51 years is 38 grams while that of women of the same age is 25 grams. Fiber benefits include lowering cholesterol levels, controlling bowel movements and regulating blood sugar. Sweet potatoes when baked together with the skin contain high amounts of beta-carotene whose daily recommended amount is 26081.9 international units for each serving. A medium size sweet potato provides four times of this requirement. The body converts beta-carotene into vitamin A, which helps in improving eyesight and preventing or treating eye conditions. In addition, it boosts immunity and helps in treating or preventing cancer. The skin of a sweet potato has vitamin C, E, as well as folate. One sweet potato contains vitamin C 29.51 milligrams, which is about half of the daily recommended amount. One sweet potato serving provides 100% of the recommended daily value of vitamin E without saturated fats. A sweet potato serving contains folate 18.2 micrograms. Vitamin E and C boost your immunity, protecting you from diseases. Sweet potato skin is rich in potassium and iron. An average sized baked sweet potato with skin provides about 542 milligrams content of potassium. The daily recommended amount is 4,700 milligrams of potassium but sweet potatoes contain higher amounts of potassium than other foods. Sweet potatoes are a good provider of iron particularly for those who don't take meat. Some people dismiss sweet potatoes as old potatoes with a sweet flavor. This is far from the truth because they have nutritional benefits. The health benefits outlined below provide more answers to the question: can you eat sweet potato skin? Sweet potatoes contain B6 vitamins, which break down homocysteine. Homocysteine hardens blood vessels and arteries. They contain potassium that lowers blood pressure by regulating fluid balance. Potassium is an electrolyte that regulates the heartbeat. Sweet potatoes unlike other starchy foods release sugar slowly and steadily into the blood stream. Hence, you have a constant flow of energy. They are rich in manganese, which helps in the metabolism of carbohydrates. This maintains healthy blood sugar levels, stabilizes your appetite, and helps the body utilize antioxidants. Sweet potatoes have anti-inflammatory benefits because of their color-pigmented vitamins. A sweet potato provides about half of the daily requirement of vitamin C. Vitamins A and E in sweet potatoes are powerful antioxidants that boost the immune system. Orange sweet potatoes are rich in vitamin A while purple sweet potatoes are rich in anthocyanin. Besides, vitamin A in sweet potatoes also protects the skin against sun damage. Vitamin C and E, which have beauty benefits, boost collagen growth, and give a health, glowing skin. Orange sweet potatoes have anti-carcinogenic properties. Sweet potatoes are rich in beta-carotene, which reduce the risk of breast cancer in premenopausal women and the risk of ovarian cancer in postmenopausal women. Purple sweet potatoes have better cancer-fighting abilities than orange sweet potatoes. Relieve stress: Sweet potatoes contain magnesium that boosts relaxation, calmness and improves your mood. Magnesium also boosts blood, muscle, nerve, and bone health. Having answered the question, ‘can you eat sweet potato skin?’ the next step is to learn how to select, store and prepare sweet potatoes. It is very important if you want to reap its benefits to your body. First, you need to select firm sweet potatoes without any cracks, bruises, or soft spots. Do not pick any refrigerated sweet potatoes because low temperatures alter their taste. Also do not refrigerate sweet potatoes; instead, store them in a cool, dark, and well-ventilated room. They will stay fresh in such an environment for up to ten days. The temperatures should not rise above 60°For 15°C, otherwise they will impact them negatively. A root cellar is excellent for storing sweet potatoes but you can also store them in cupboards or in punched brown paper bags as you wish. The healthiest ways of cooking sweet potatoes include boiling, stir-frying and steaming. Boiling is a great cooking procedure even for sweet potatoes. Boiled and mashed sweet potatoes increase levels of vitamin A in children. Boiling is more effective in regulating blood sugar and providing sweet potatoes with a lower glycemic index (GI) value compared to roasting or baking. A roasted sweet potato has a GI value of 82, a baked sweet potato 94 and a boiled sweet potato 46. You can also stir-fry sweet potatoes in oil at a 200°F (93°C) temperature for five minutes. Stir-frying enhances the bioavailability of beta-carotene in sweet potatoes. Steaming sweet potatoes can be done by filling a steamer pot bottom with about 2 inches volume of water. Slice potatoes to 1/2 –inch pieces and steam when water comes to rapid boil. You can dress and top them with your suitable ingredient. Steaming maintains all nutrients and flavor in sweet potatoes. What Can You Eat to Boost Energy Before Finals?